About "Coefficient of concurrent deviations"
A very simple and casual method of finding correlation when we are not serious about the magnitude of the two variables is the application of concurrent deviations. This method involves in attaching a positive sign for a x-value (except the first) if this value is more than the previous value and assigning a negative value if this value is less than the previous value. This is done for the y-series as well. 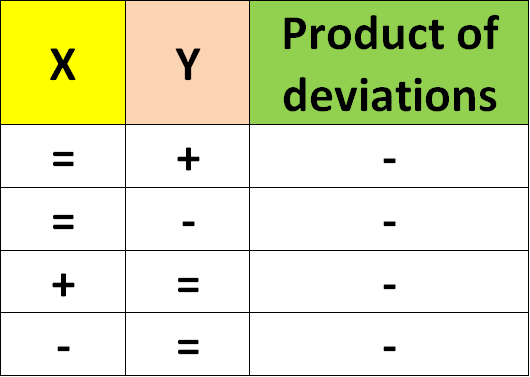 The deviation in the x-value and the corresponding y-value is known to be concurrent if both the deviations have the same sign. If (2c–m) > 0, then we take the positive sign both inside and outside the radical sign and if (2c–m) < 0, we are to consider the negative sign both inside and outside the radical sign. Like Pearson’s correlation coefficient and Spearman’s rank correlation coefficient, the coefficient of concurrent- deviations also lies between –1 and 1, both inclusive. Find the coefficient of concurrent deviations from the following data. Computation of Coefficient of Concurrent-Deviations. We attach a positive sign for a x-value (except the first) if this value is more than the previous value and assigning a negative value if this value is less than the previous value. In case, a particular value is equal to the previous value, we have to attach "=" sign to that value. 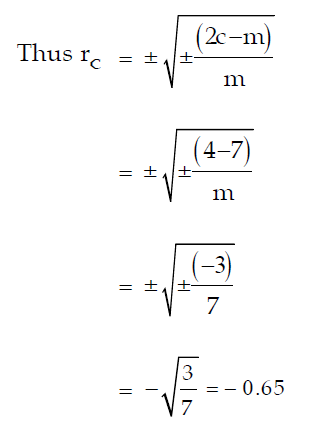 And we have to do product of deviations as given below. 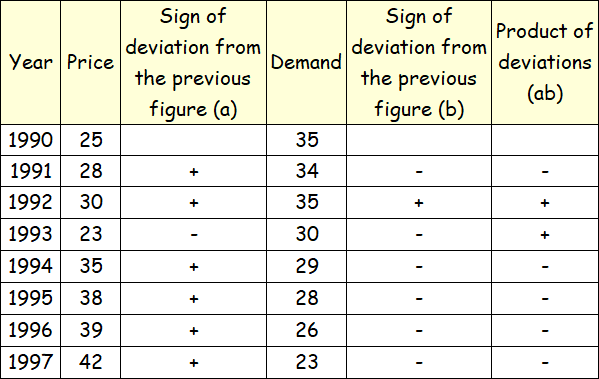 Since ( "=" and "+" ) or ( "=" and "-" ) are different signs, we have to put negative sign in the column "product of deviations". There are some cases when we may find a correlation between two variables although the two variables are not causally related. This is due to the existence of a third variable which is related to both the variables under consideration. Such a correlation is known as spurious correlation or non-sense correlation. As an example, there could be a positive correlation between production of rice and that of iron in India for the last twenty years due to the effect of a third variable time on both these variables. It is necessary to eliminate the influence of the third variable before computing correlation between the two original variables. After having gone through the stuff given above, we hope that the students would have understood "Coefficient of concurrent-deviations". Apart from the stuff given above, if you want to know more about "Coefficient of concurrent-deviations", please click here.